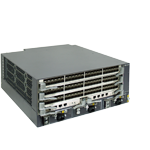 The S9303 supports a maximum of three Line Processing Units (LPUs). The dimensions of the S9303 are 442 mm x 476 mm x 175 mm (width x depth x height). Facing the chassis, the LPUs, MCUs, and power modules are mounted from top to bottom.Ventilation and heat dissipation of the S9303 are performed from the back ofthe chassis. The handles reside on both sides of the chassis. All components of the S9303 are located on the front panel for maintenance. There are totally five slots for horizontally inserted boards in the board cage. The two half-height slots in the lower half of the chassis are reserved for the MCUs that support 1+1 backup mode. The other three slots are reserved for the LPUs. The fan frame and air filter of the S9303 are located at the back of the chassis. Located at the bottom of the chassis, the power modules work in 1+1 backup mode and support double power supply networks for power input. The power modules can be either AC power modules or DC power modules. The power modules support PoE. The PoE function supports only the AC power supply and does not support the backup of power modules.